A retrospective exhibition of the photographs of Jonas Mekas, as well as a selection of his avant-garde films, will be on view at the Cēsis Art Festival from July 11 to August 6. Mekas himself will be present at the Festival's opening, and on July 12 he will participate in a public discussion moderated by the film critic Viktors Freibergs. In fact, the Stūra Māja / Corner (KGB) House exhibition, currently going on in Riga through October 19, includes one of Mekas' installations documenting the collapse of the Soviet Union. Globally, Mekas is known as the Godfather of American avant-garde film, as well as a filmmaker, film theoretician, artist and poet; he regards himself as a farmer, firstly. Arterritory.com met with Mekas before the exhibition in Cēsis, in his Brooklyn studio, where he mused on why Eastern Europe will be saved by death, and why the avant-garde is always present. Yes, there will be photographs as well as some frames ‘extracted’ from my films. The photographs have, for the most part, been taken by others, but these that will be extracted from my films, I did myself, so it’s a mix. The photographs begin with me age four and ending just now. It's a selection from thousands and thousands of photographs. This will be your first exhibition in Latvia, even though you were born almost right on the border between Lithuania and Latvia. Yes, about 30 km or so from the border. I wasn't born in Biržai, I was born more closer to Papilys, a little bit further. My father used to take some products and by horse carriage bring them to the Riga Market. So it was not that far. And then you hid a Latvian under your bed, that was in Germany? What was that story? During the war I was in a forced-labor camp in Elmshorn, not far from Hamburg. That was in 1944, and we were in the camp with Italian and French war prisoners; it was run by the army, but one could sort of get in and get out of it, there was not that much guarding. One evening, a young man was brought to me by French war prisoners, he was taken to my room – it wasn't exactly ‘my’ room, there were about 15 of us – and they said he was Latvian. I don’t know how he came in, but he had escaped from a trench-digging camp near Hamburg, and usually those places had very hard conditions, hard work. I think he was trying to run further to Denmark, so I hid him under my bed over the night. In the morning, I took him to the train station. We couldn't walk together – that would get us noticed – so he was walking a few steps behind me. We arrived at the station, I continued. I looked back, and I saw him getting on the train. I never met him again. I don't know if he even made it to Denmark. The former KGB headquarters in Riga were opened to the public on May 1, and inside one can see your four-screen installation, Lithuania and the Collapse of the USSR. What do you think about the events going on in Ukraine now? I think that Putin is trying to recreate the old Soviet Union, and he's not hiding it at all; he says so. He's trying to create a former Soviet Union, maybe in a slightly differently composed, and differently run, but it's still his dream. However, I don't think it can happen today. I don't think that the Russian Federation can control so many other countries. They could occupy Ukraine for two or three years, but we're in a different century. But temporally he can do a lot of damage. There is a new generation, and I think that Putin is getting support in Russia itself only from the older generation. The new generation's way of thinking is completely different. The old generation will die out, and the situation will change. The death is what will save Eastern Europe and Russia. (Laughs) You see, Gorbachev could not help, he couldn't do anything because all those counties liberated themselves; it couldn't be stopped. It’s obvious by now, when we look back what was happening. The exhibition in Latvia isn't the only thing you're working on now. I hear that you're planning on building a library. 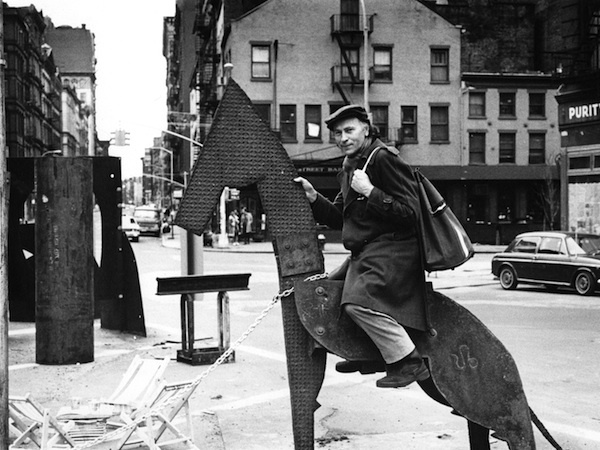 It has to do with cinema, with Anthology Film Archives [a film museum in New York founded by Jonas Mekas and his colleagues for alternative cinema – Ž. S.]; it's a museum of film. We began as a very small institution in 1970, but by now we have so many films and paper material that we need more space. That's why this year and the next, much of my time will be devoted to building an extension. We have space; it’s only question of raising the money, as always. We aren't supported by the government or foundations; we're completely independent. We work every day, but we never know where the money will be coming from. You're currently working on the sequel to the diary you wrote. Yes, around 90s I switched from film to video. Up to then, I did a lot of writing. I had my ‘film diaries' and I also had a written diary. Beginning with my video period, there is less and less writing, I only kept up a video diary. Video camera replaced my typewriter. During last year, and this year, I have been working on preparing my written diary for publication; it's a huge job – preparing diaries that have been written over a period of 50 years. This is sort of my literary year – I just finished a book called Anecdotes; it's sort of autobiography in the form of 200 short anecdotes – about different people and events from my life. It's coming out at the end of the year. Last year my poetry book Idylls of Semeniskiai came out in German, and my 1944–1 950 diary, I Had Nowhere to Go, will come out next year. Do you see yourself as primarily a poet, a filmmaker, or maybe an artist? You are described as many things. I wear many different hats. I started off as a writer – as a poet and journalist. When I arrived in New York, I added cinema to that, and soon enough I was involved in creating various organizations and curating film screenings. For instance, in Lithuania I am a poet – many people don't take seriously my filmmaking there. In the rest of Europe – like, in Paris – I am a filmmaker. In the US they are confused – am I a filmmaker, or an organizer, a curator, or a film critic? They really don't know how to describe me because I've worked in so many different areas. For twenty years I was a film critic for The Village Voice, same time I created the Anthology Film Archive, the Filmmakers Cinematheque and the Filmmakers Cooperative (which deals with the distribution of films), as well as Film Culture Magazine; I've worked on so many different fronts, I have worn so many different hats. Speaking about film critique, have you ever said something that you later regretted? I've never been a real film critic; my Village Voice columns [beginning with 1958, Mekas wrote a controversial column for The Village Voice – Ž. S.] weren't reallly critiques. I never wrote about films that I didn't like. I always wrote about films that I loved and that should be loved by others as well. Usually, I tried to ignore those kinds of films. The same with Film Culture Magazine – we gave pages of Film Culture Magazine only to those films that we – and that wasn't just me, but a whole team of enthusiastic writers – had approved. We didn't write about films that we thought didn’t deserved any sort of publicity. So, there was never anything that you wrote and later regretted? No! And many people thought I was crazy really – based on the films that I showed and wrote about. But now, 30–40 years later, they're all classics. I did not make mistakes. And all of these organizations that I established – I did it only because no one else was showing these films; it had to happen because no one else was doing it. I never do anything that somebody else is doing. Why should I do something that someone else is doing? And why should I do something that isn't necessary? There was no film magazine in the US, so I had to do it; there were no independent distributors for independent filmmakers, so the Filmmaker Cooperative had to be created. We had to do it; I had to do it! The Village Voice column – that had to be started because nobody else was writing about or paying attention to this cinema that was emerging, coming into existence, and I thought it was beautiful and important. I had to do it. The same goes for the Filmmakers Cinematheque and the Anthology Film Archives. Every week you film something and put it on your website. What is your relationship to the digital era? Those are the new technologies; there isn't any other technology – there is no film anymore! If you work with moving images, you have no choice but to accept the new – to accept the existing. You can't work with a technology that doesn't exist anymore. You could still try to work only with film. Kodak is closed, there is no more film; there may be some film stock left here and there, and there are some young people who are trying to continue until all that stock is used up. But the art of cinema, created before the digital technologies, must be screened and seen as film, not video. Eventually every country – or maybe UNESCO will have to be produce technologies to preserve and project films as films. So that in every country, there should be at least one place or museum where films can be projected and preserved as films. To see a film on video is the same as looking at the reproduction of the painting in a book. You still have to go to Florence or Assisi to see Giotto original. Don't you have the feeling that, as a result of this change in technology, something has been lost? And now we are here, with these new technologies, and the old technology is finished; but the works are here and we try to preserve the films on film as long as it will be possible. Maybe for another 200 years. But today we work with the new technologies; that's normal. Plus, there's a need for it – we look differently, think differently, we look at everything differently, and we want to record different aspects of human experience – those that film could not record. The digital technologies permit to go into different situations… We also carry the technology, the tools in our pockets; they are very accessible to everyone. Every child can make a movie, record animals, lizards, birds – anything! The same way that you can write absolutely anything. Nevertheless, technologies are much more accessible, and there's a talk of an approaching third wave of the avant-garde, that is coming. So, the avant-garde is possible even today? It cannot be avoided! One cannot eliminate the avant-garde! There is always the first line, in every area. In every field, there is always the first, the front line. Of course, there is all of history. But always, always there is this moment – the now, today! Everything starts from now; we live every second of it, and what’s behind the past second is history already! But so much in art and history comes back; can we really invent something new? We have no choice. Everything is new at every moment. Every moment everything is new. At every moment we use new tools, and we use them in different way, and once those tools can't adapt to the changes of life, we invent a tool that will adapt to this changing life. Life keeps changing. And changes in life require new tools. It's not the tools that invent a new life – it's the new life that creates new tools. And, of course, we also look back and try to keep memories. Ninety-nine percent of art is reflex based on that which already has been done. But then there is this one percent. We are so used to seeing what has been around us already for some time – like when a child goes into a store and immediately goes towards what he wants, what he knows. His eye-memory wipes out all the rest; we're always surprised at how, among ten thousand toys, a child heads straight towards what he wants. And in the same way, humanity sees only the art that has been around us, the art that we are used to – but we don't see that one to two percent that is already in a very front line moving to somewhere else – that is the avant-garde line. You see, we're are not yet accustomed to this; we don't have this eye-memory, which is why we don't notice it. But there is avant-garde every moment, every second; everything moves ahead. You cannot avoid it. Starting with the Big Bang, everything moves forward, you can't stop it. You've been around for a while – you have experiences Andy Warhol, the Fluxus era, and so on. What have been the major changes that have taken place in the art world? I haven't followed that so closely, but in terms of the moving image, we see that even the tools that we used in the 1960s, 70s and 80s are not there anymore. The tools are different, the technology is different, everything is different. Huge changes have taken place in every art form. Peter Sampel has made three films about you. What is it like, as a director, to be filmed in someone else's film – in a sense, becoming an actor? We're talking about Peter Sampel here, and not about conventional, ‘normal’ documentary filmmakers. Sampel is completely different. He becomes a part of the film he makes. His style of filming is very open; he doesn't create documentary films. There's always a lot of music; they're very musical. He makes musicals about people. It’s very possible. I cannot describe myself; I cannot look at myself from the outside. Whatever I do, I have a need to do it, so I really can’t talk about myself. In a way, your life has been ‘exhibited’ through your personal films, photographs and other works. Doesn't that make you think about things? I simply keep moving ahead; I am not looking really back. I have no time to look back. I don't look at my films, except if I'm at the university or in some special situation where they want me to be. I simply continue to move forwards. But when you do see your films – which are, actually, your life – how do you feel then? They are people who have the same sensibility in terms of music, or poetry, or cinema. Yes, Peter and Phong Bui, who's the editor of the Brooklyn Rail, the monthly magazine – he's also an avant-gardist, a magazine avant-gardist. They all know history – like, Phong has studied art history, but he’s only dealing and seeing with what’s been done now; his magazine is about what’s being done now – the most current developments in art. So, these are my people. And that was always so, in the sixties they were Andy Warhol, Lou Reed, or Richard Foreman in theater. The same was then and the same is today. Doesn't this need of yours to record certain moments of your life take away the ability to really experience them? What does it mean ‘to experience’? We all live non-stop until we die. But to participate... I cannot geographically be in New York and Tokyo at the same time, I cannot read all of the books that others read. You are in touch only with tiny fragment with what happens any given moment on this planet. But that’s given, that’s already something that you cannot change. I mean in the sense that, when you're behind the camera, you can't be filming and experiencing what is going on at the same time. But I do experience it! I am in the moment! I am there! I see and I film, and I see! I am there. That is what the word ‘to experience’ also means – to see, to hear, to smell, if need be – to touch. I heard that when you were a child, you had something like superpowers...? It's actually quite the opposite – I was about to die, couple of times, I don't know exactly of what. But I do remember it – I was about four or five years old, and I was deathly ill. I remember the women standing around my bed and talking; I remember very well hearing them: “Oh, the poor boy, he's going to die.” They were real brutal in their expressions. And I thought to myself: “I will show you! I won't die!” They knew that I could hear them and they were talking about my death, in my presence. And for a time I was in that condition – close to death. But I got out of it. Of course, later, when I began to read, I went through a period when I was maybe sixteen or seventeen years old, and I could see and hear things that others couldn't. I had to really work at getting rid of this sensitivity – or over-sensitivity – that was natural at the time, and into which I would go deeper and deeper. It would usually be some drastic event – somebody dying, or someone being run over by a car. Before the people came to tell us what had happened on the street, I could see it. I'd see man run over by a truck, or I'd see the cyclist run over by a truck. Things like that I used to see, right in front of my eyes. Then, minutes later, they would come and tell us what had happened. I saw blood, the cyclist – things like that. And when did this stop happening?